Hey there! I'm back today with a look at this month's Maniology Mani X Me Box (pronounced "mani by me" for those of you who might not get that right away...I didn't!). 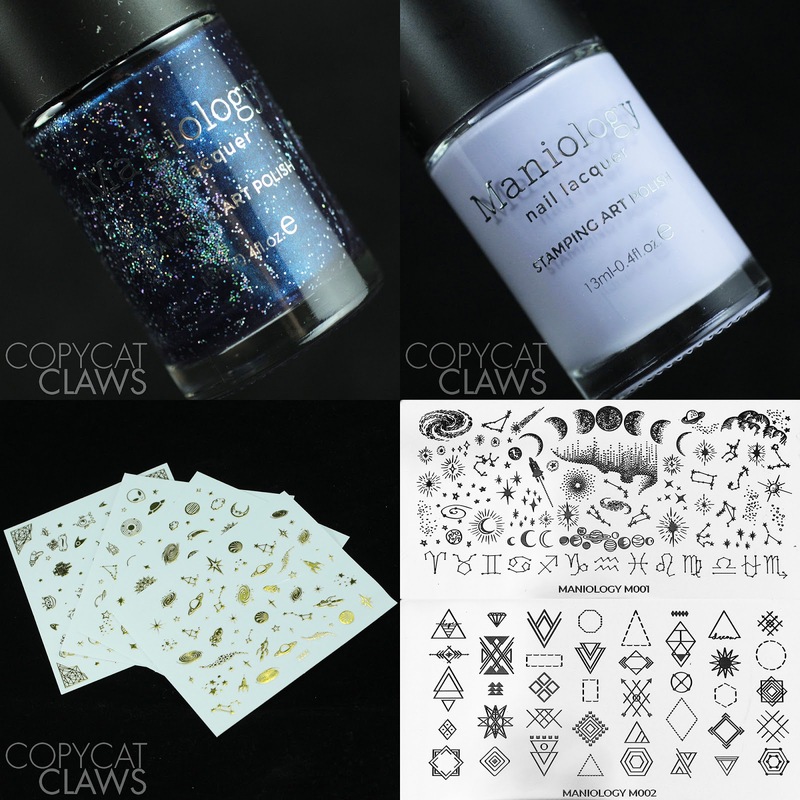 The Mani X Me Box is a monthly subscription box that is guaranteed to contain two stamping plates, two Maniology polishes and some extra nail art goodies. Also, if it's your first month, they include a rectangular clear stamper called the Ice Cube. 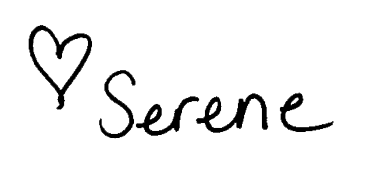 But don't let the "subscription" idea scare you because it sounds like commitment. You can skip month's that you're not feeling or just buy a single month at a time. And let's not forget the pineapple gummies. I don't know if they're a guarantee but they are the most delicious candy I've ever tasted. I didn't snap a picture of the gummy time around because, I'm not kidding, I ate it as soon as I opened the box, haha! Here's a brief look at what was in January's box. 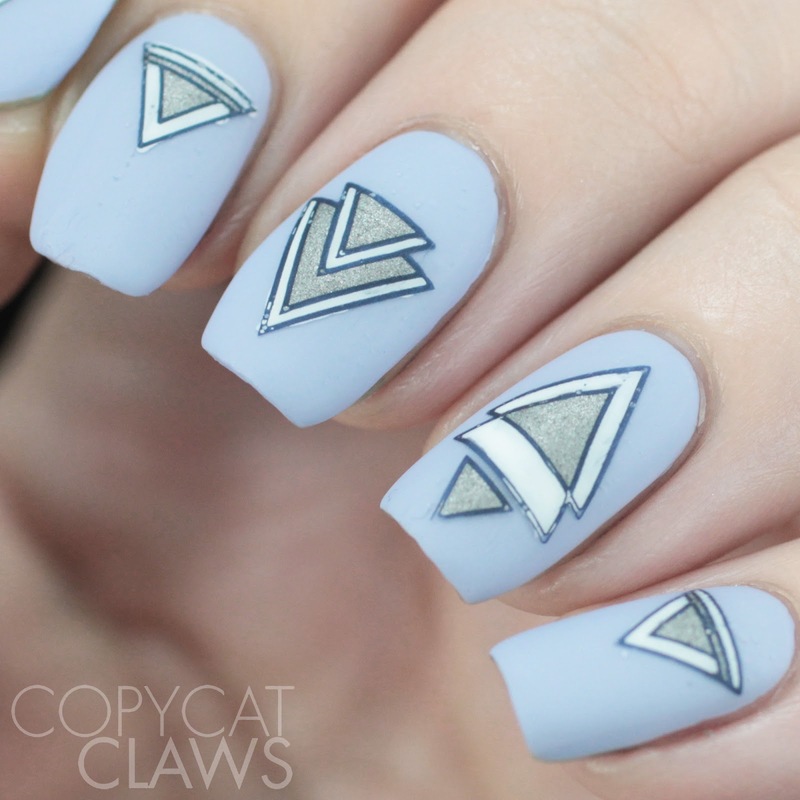 It included Celestial and Lilac Clouds polish, 4 sheets of metallic gold nail sticks and two stamping plates. I can't tell you enough how much I loved this box! 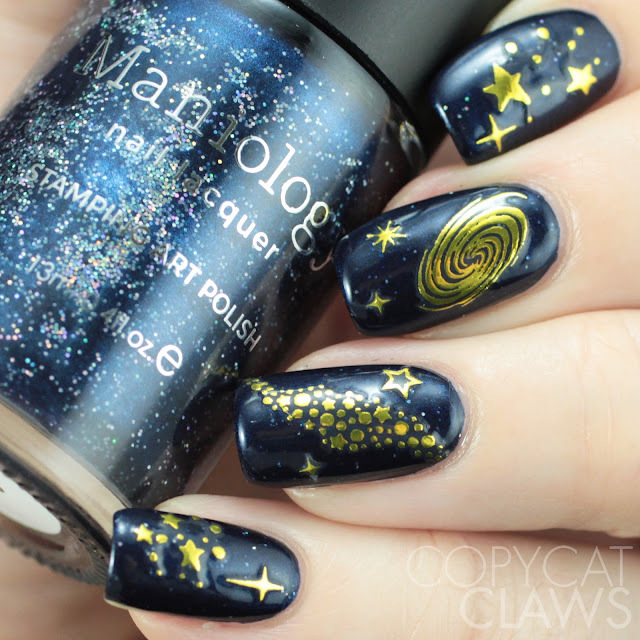 Celestial is a very pigmented navy blue metallic polish with sparse holographic microglitter. The glitter in mine seemed to settle on the side in transport so it's possible that there could be more glitter in a different bottle but this is how mine came. The glitter made it dry with a slight texture but not enough that it wasn't smoothed out with one coat of top coat and certainly not enough to affect removal. This swatch photo shows two coats plus Vibrant Vinyls top coat. 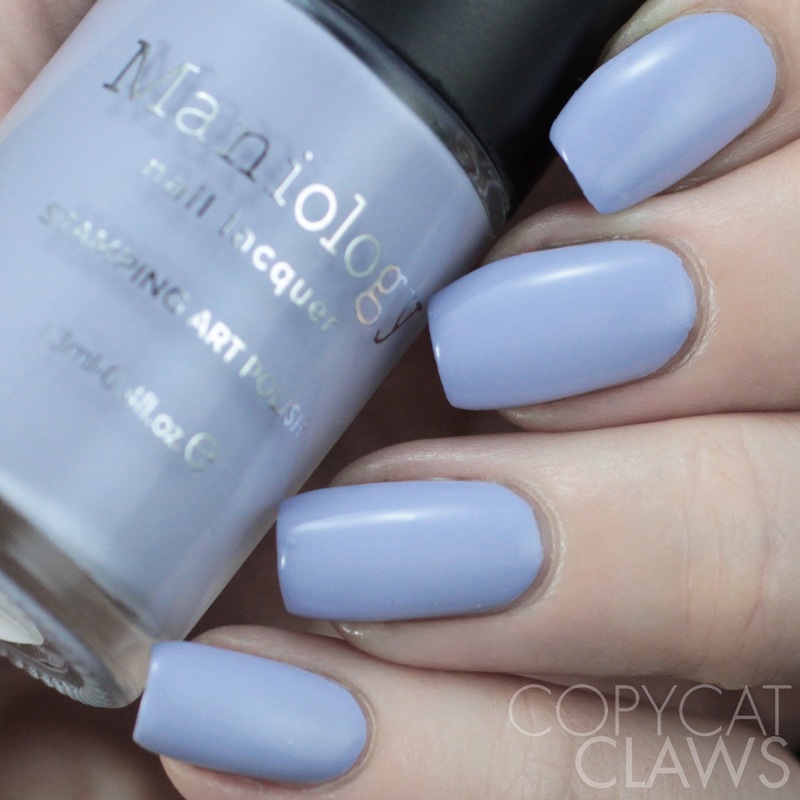 Lilac Clouds is a pale cool-toned purple cream. The formula is super creamy and opaque. It was opaque at one coat but the swatch photo shows two plus top coat. Application of both polishes was easy but my one slight qualm is with the shape of the brush. The brush is square (which isn't an issue) but with the width of it and the thickness of the formula, it's difficult to get the curve of the nail easily. Obviously that doesn't matter if it's only used as stamping polish but since these are great as regular polish too, a slightly more narrow brush would be nice. Next up is the M001 stamping plate. This plate has an absolute ton of space-related images of varying sizes. 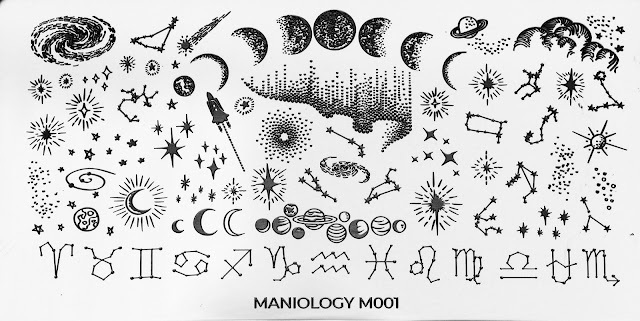 The etching of both plates was great, as I've come to expect from Maniology plates. Since I'm a northern girl, I was immediately drawn to the aurora borealis image. First I tried it using Lilac Clouds over a black base. 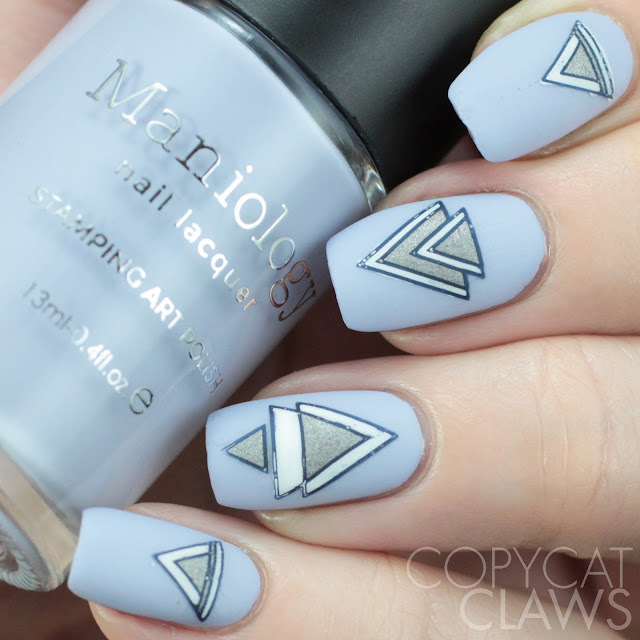 Lilac clouds stamps really opaquely but a bit of the color is muted over this dark base. To finish this mani, I then stamped again using Mundo de Unas Avocado. These is definitely a beautiful take on the northern lights and I'm happy to have a stamping plate that tries to replicate one of my favourite natural phenomena. The M002 is not as space-focussed as the the rest of this month's box. Instead it has dozens of smaller geometric images. The lines on this plate are very fine but still picked up with minimal effort. Here I did some reverse stamping using Celestial as the stamping polish. 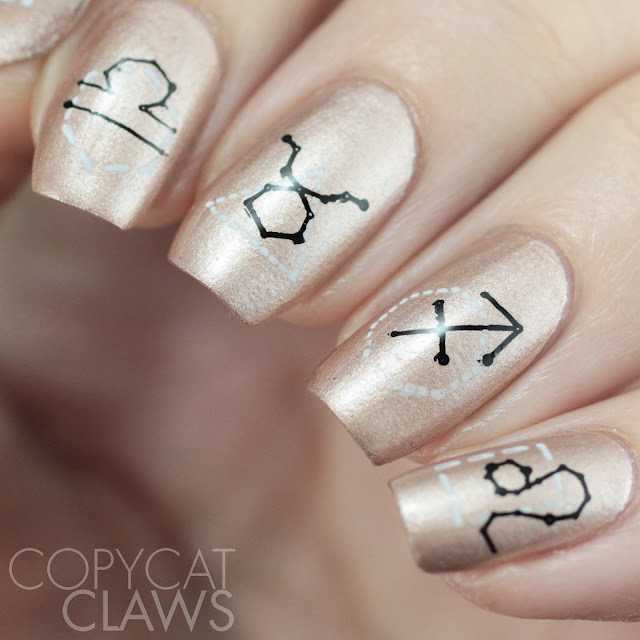 I think it would've been easier if the formula was thicker for these fine lines. 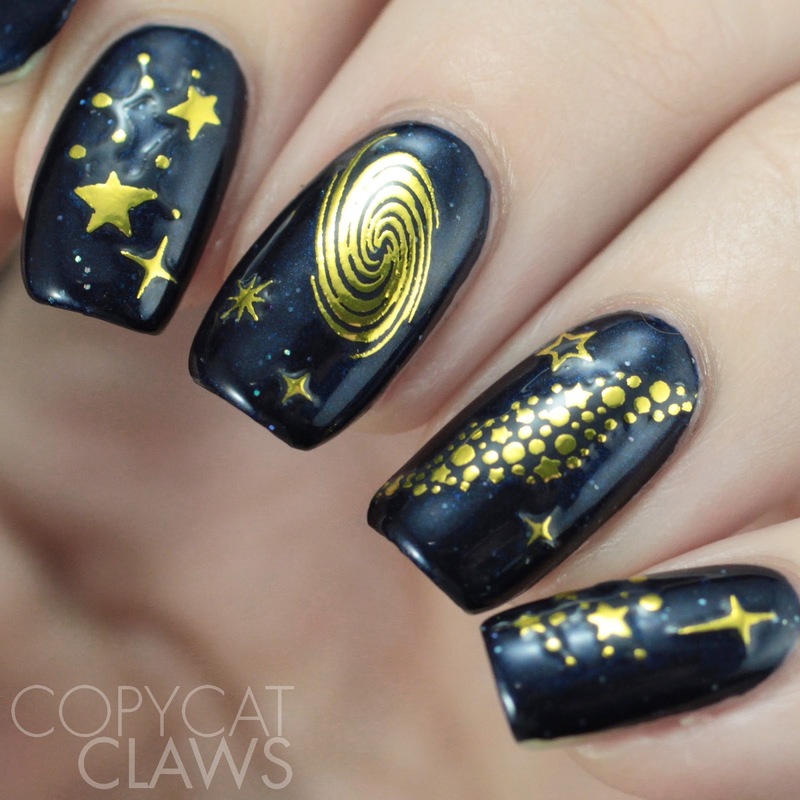 With these fine lines, you can see that the holo glitter is lost and instead it's more of a navy stamping polish. I filled the stamping with Mundo de Unas White and Moonflower Polish Diamante, applied it over a tacky base and finished with matte top coat. Even my 8 year old niece said these were cool and she never comments on my fun nails. 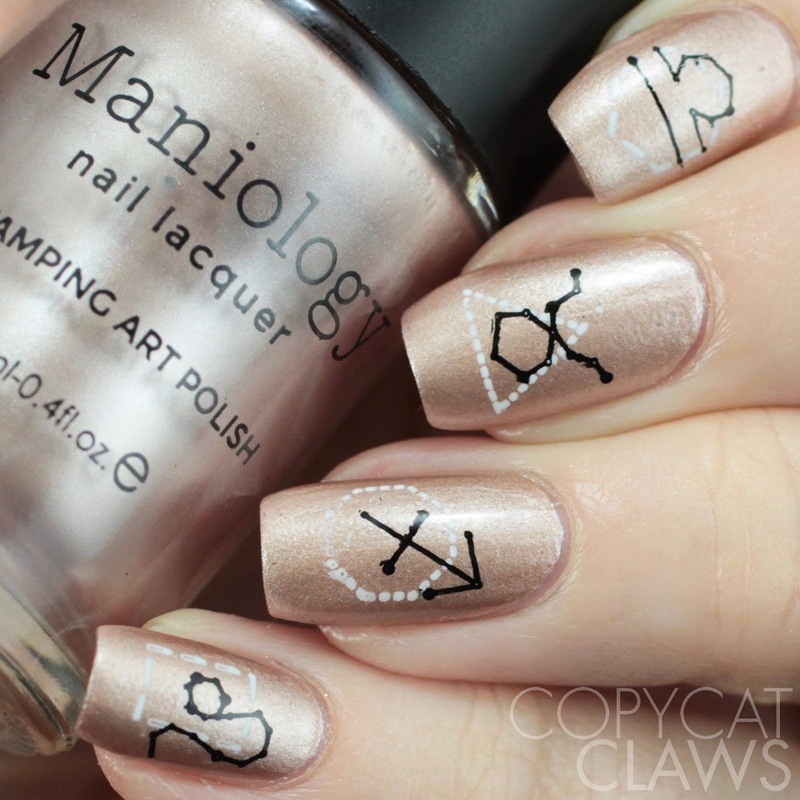 My last stamping mani used both the plates together. 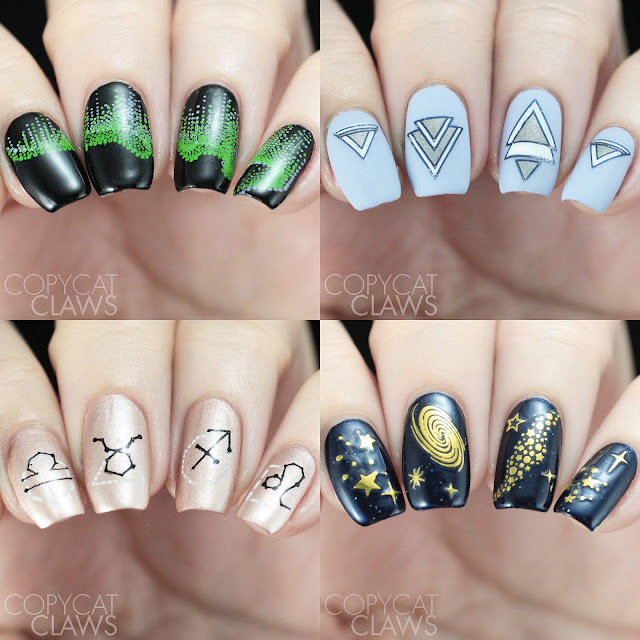 I used December's Mani X Me polish, Snowdrift as a base and then stamped with Mundo de Unas White and Black with all the astrological signs of my family (I'm on the ring finger...Saggitarius!) and finished with Vibrant Vinyls top coat. For my final mani, I used the gold metallic stickers. I don't normally like stickers very much but I loved these SO MUCH! I found them easiest to remove from the sheet using pointy tweezers. You could get them off with just your fingers but it might be more difficult to place them that way. I applied them over Celestial and topped with Vibrant Vinyls top coat. I thought I'd get more bubbles around the stickers because they're raised but the bubbles were minimal. And they're so shiny. They've made me change my mind about stickers! I hope this gave you an idea of what kind of products you can expect in the Mani X Me box. 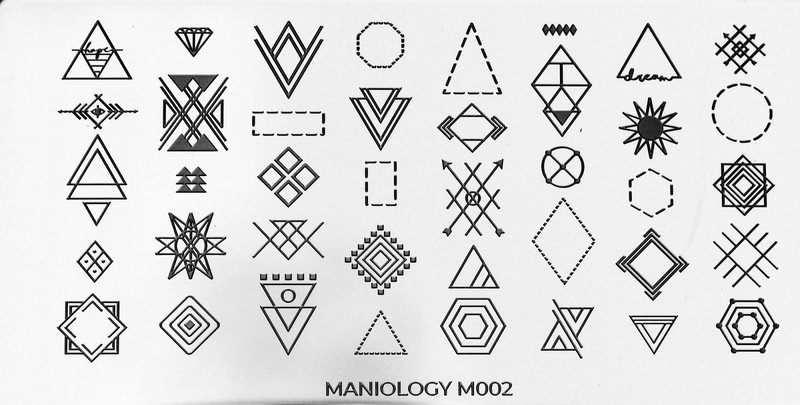 Each month is entirely different so if you're curious from month to month, you can always check out the previews that Maniology posts on the Mani X Me page before the boxes are sent out.